MTBank, one of the most efficient Belarusian banks, has recently installed a currency exchange terminal with a coin payout function available in self-service mode. 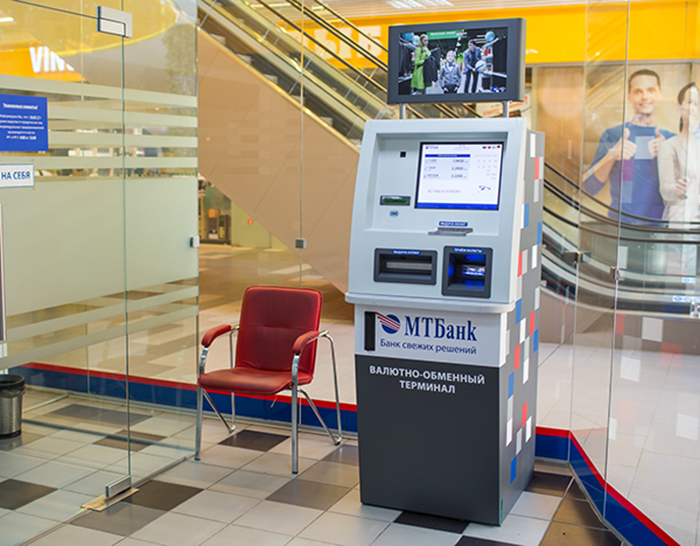 The terminal is launched at an MTBank’s branch office in the MOMO shopping center in Minsk, Belarus. The equipment and the software are developed by the Belarusian development centers of IBA Group. The currency exchange terminal enables the users to exchange US dollars, euros, and Russian rubles for Belarusian rubles using cash in a self-service mode. Using this unique device, bank customers can receive both Belarusian banknotes and coins from the currency exchange terminal. To this end, the terminal is equipped with a dispenser for banknotes and a hopper for coins. The current exchange rates set by the bank, as well as the banknote values that the terminal accepts are displayed on the screen. Earlier this year, IBA Group launched the first currency exchange terminal with a coin payout function in the Belarusbank’s branch office located in the Stolitsa shopping mall in Minsk, Belarus. For IBA Group, banking IT is one of the priority business lines. The IBA Group’s banking solutions and services are related to digital banking, corporate banking, retail banking, IT infrastructure, and analytics. Currently, all major banks in Belarus use IBA solutions. In the area of retail banking, IBA covers 85% of the Belarusian market of payment terminals. Proven expertise in card technologies and the EMV kernel certification are among other reasons for the company to dominate the banking IT market in Belarus.